Charter buses are an extremely safe way of traveling. From school trips to special events, group tours, sporting and corporate events, hiring a coach bus to transport your group is a great, safe way of getting from one place to the next. Via Trailways has been a trusted name in the motor coach industry since 1982. We have provided hundreds of customers with quality service, helpful drivers, and comfortable coaches. On a monthly basis, we inspect each of our vehicles to ensure they are operating with extreme efficiency. Prior to every trip, our drivers conduct safety inspections of their vehicles before hitting the road. Each of the vehicles in our fleet have been certified by the Department of Defense for excellence in safety and U.S. military transportation. 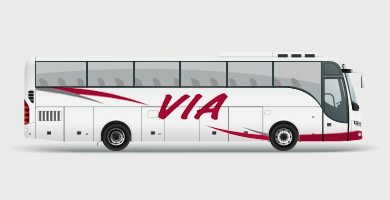 Each driver on the Via Trailways team has at least 5 years of driving experience, a clean driving record, and are cleared by DOT on physical and drug screenings. Thanks to our incredible team, Via Trailways consistently ranks within the top 5% of safe operators and are recognized by one of the nation’s top security carriers. All of the drivers we hire are put through a rigorous safety and training program to ensure each passengers safety. We are committed to providing our customers with safe, reliable, and comfortable transportation. Contact us today to schedule safe transportation for your next event.